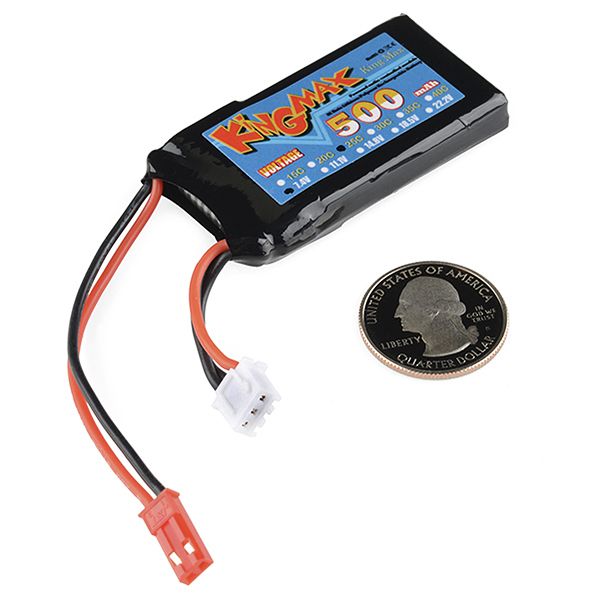 This LiPo is a hardy little battery pack. They managed to pack a constant discharge rate of 25C into this battery. For its size, it has one of the highest discharge rates on the market. This is an excellent choice for projects that don't use a lot of energy but need a lot of current for short amounts of time and need to be small. The battery has two cells and outputs 7.4V storing 500mAh of charge. Because this is a dual cell battery pack, a special charger is needed. This battery is not compatible with single cell chargers. A compatible charger is listed below. Note: Due to shipping restrictions, only two batteries can be shipped together at one time. We should be able to ship more than two batteries at a time by the end of 2014. Sad to see this part retired! Are you guys phasing out multi-cell LiPos because they lack protection circuits? Or just getting rid of this one because the 1000mAh version is already cheap? Because of the 500 mAh's small dimensions, I used this battery in several projects, including a strobe light in an altoids tin (http://www.instructables.com/id/MintyStrobe2-an-adjustable-strobe-light-in-an-Al/) and also on a line follower robot (instructable coming). If the battery is run down too far without recharging, is there anything that can be done to resuscitate it? I've had this happen on several LiPo batteries (1S and 2S) and my Tenergy 1-4S balance charger doesn't seem to even recognize the battery. I thought LiPos were going to be a perfect solution for a wide range of small robot projects and bought a dozen of various sizes, but a year or two later, half seem to be worthless, even ones I've never used. Is this normal for these batteries? All batteries? Do alkaline or NiMH sometimes work better? If you Google a bit you'll find advice on recovering LiPos, but note that 1. Overdischarging physically damages the cells, 2. You may need to tear apart the pack to work with the individual cells, and 3. LiPos can be VERY dangerous if you go outside the normal charging envelope. Be extremely careful while you're trying to recover it, and NEVER leave a hacked charger unattended. These high-discharge batteries don't have a protection circuit built into them, like our smaller LiPos do. This allows them to provide massive amounts of current, but unfortunately it means that they're more susceptible to abuse. While using them, it pays to have a monitoring system in your projects (and to heed it's advice) to prevent deep discharges. And while they're in storage, set a reminder to give them a maintenance charge every so often. Some other battery chemistries tolerate rough treatment better, but it's all tradeoffs. 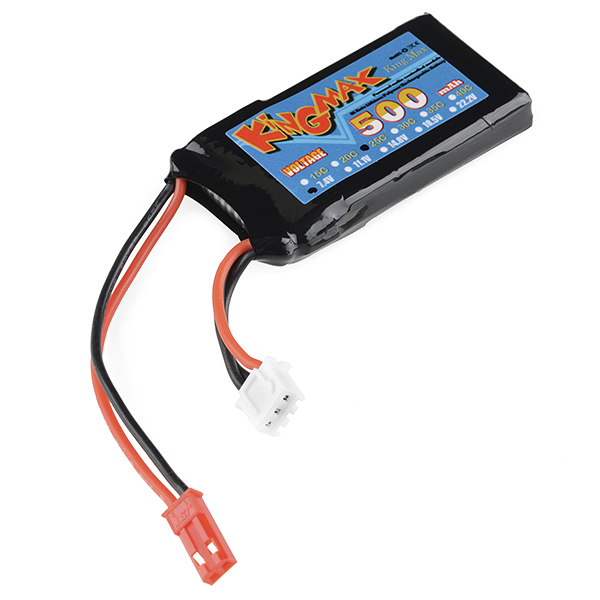 LiPos are about your only option if you need serious power and light weight. Thanks, Mike. I found some reports of a little success using a NiMH charger to get them up high enough that the LiPo charger will recognize them, but as many other reports say that is dangerous and rarely do they work long after that anyway. I also don't have a NiMH charger since I've never tried NiMH batteries. 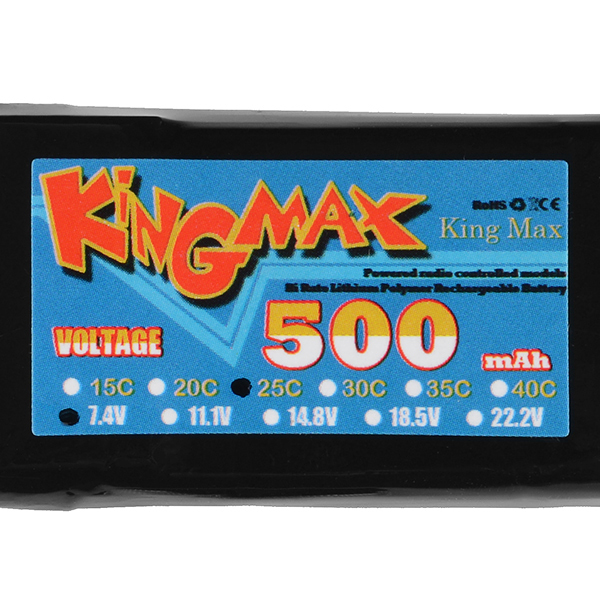 As for the protection circuit, half of the batteries I bought were the 2S, 3S, and 4S ones made by Kingmax that don't have protection circuits, but the others were the regular 1S ones you guys sell that do have the protection circuit, but half of those seem to have died in storage as well. :( I guess the real lesson is don't buy batteries until you actually need them. can I charge this battery with two PRT-10217 LiPo Charger Basic - Micro-USB ? No. Those boards are designed to charge single cell lipos. This requires a special charger capable of multi-cell batteries. Check the related products below for the proper charger. Is this battery really secure ? There's 2 cells serialized. But when several Lithium cells are serialized, they can become unbalanced. Example, for a total of 6V, 1st cell voltage can be 4,5V and 2nd cell voltage 1,5V. So to serialized several cells, a Battery Management System (BMS), which control each cell separately, is mandatory. 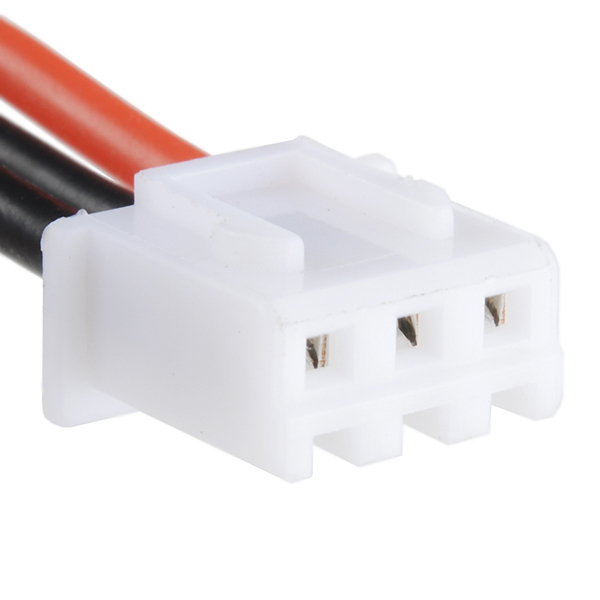 Is there a tiny BMS inside this little pack? There is no battery-management system inside the pack. However, the cells are factory-matched to have as identical characteristics as possible, which eliminates most of the problems you describe when charging or discharging. Additionally, when you use a smart multi-cell charger such as the one in the related products, the charger will take control of the individual cells to re-balance them during the charging process. 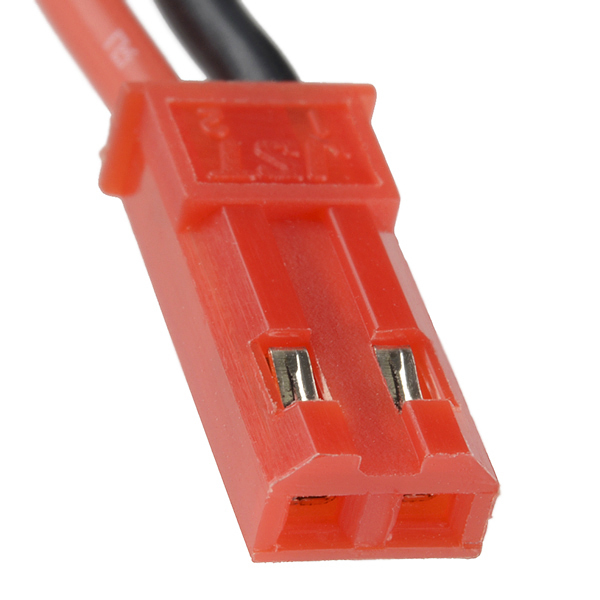 What is the maximun charging current? is the weight really 39g, so light? yeah, I think so. I checked it against our internal shipping weight and it checks out. seems legit. When will this be restocked??? ?